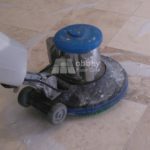 We often get asked questions about what part honing plays in stone restoration stone so we have put together this short introduction to marble and stone honing and its importance in cleaning stone and marble floors and as a preparation for polishing stone floors, esepcially marble, terrazzo, travertine and limestone. However honing is also a great cleaning aid for all kinds of stone as long as you are experienced the different kinds of honing. Over time your beautiful stone floor will wear from foot traffic, furniture scratches and etch marks from spills. The result is an dull scratched surface that gets increasingly difficult to keep clean. Honing is a process where silicon carbide or diamond particles are rubbed over the surface to remove a minute amount of stone. In the process they remove or smooth out scratches and ingrained soil. Honing grit is graded according to its size and the larger the grit the more stone it removes from the surface. There are three kinds of honing. Honing powders are mixed with water and rubbed over the stone using rotating brushes. Powder honing is ideal for very uneven floors or where the grout is dirty. The brush can push the powder deep into grout lines to remove ingrained soil. Progressively finer honing powders can be used to achieve a quite a high sheen. In recent years pads impregnated diamond dust have become very popular for commercial flooring. They achieve the same finish as powder honing, they are less messy for the operator and they need less experience in floor care to use them. Many supermarkets now use extremely fine diamond impregnated pads to maintain the shine on their terrazzo floors. Hard honing uses hard resin disks impregnated with honing diamonds. Like powder and pad honing they are excellent at removing surface scratches and ingrained dirt however they create a much smoother finish and are ideal as preparation for final polishing. Hard honing is not suited to uneven floors as the disks can chip tile edges and the tile edges can damage the disks. There are best used after a floor has been ground smooth. 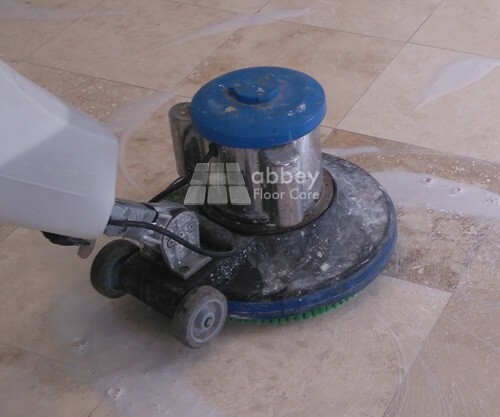 So to re-cap, powder and pad honing is ideal for deep cleaning a dirty stone floor and removing or smoothing out small scratches. 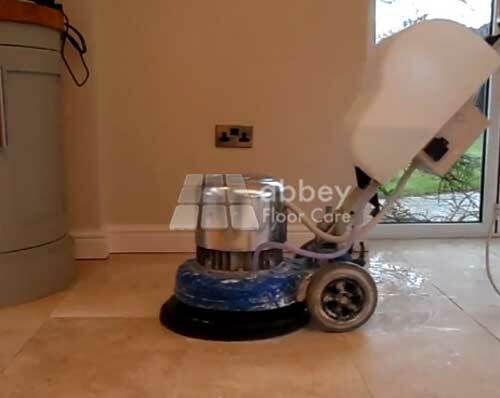 Powder honing is also ideal for cleaning very uneven floors and deep grout lines. Hard honing is best suited to smooth or nearly smooth floors. It is mainly used as preparation before final polishing.